Reinold Geiger may be in the habit of yodelling at the drop of a hat (he even yodelled in the Grand Ballroom of the The Pierre hotel, New York, after receiving The Helen Keller Visionary Award in May), but in India, where he hopes to have one of the greatest adventures of his career, the Austrian with a French passport is the epitome of French elegance and reserve. 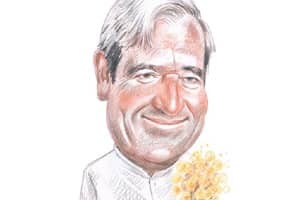 Dressed in a mandarin-collar white shirt and grey suit, this 6ft-plus, silver-haired, 64-year-old chairman and CEO of L’Occitane en Provence perhaps feels yodele yodele yodele he hoo at 9am would startle the waiters at The Imperial hotel’s 1911 restaurant in New Delhi. Two years ago, L’Occitane returned to India in partnership with Kolkata-based Beauty Concepts—L’Occitane has a 51% stake. Their venture, L’Occitane India, now has eight stores: three in Delhi, two in Mumbai and one each in Bangalore, Ludhiana and Kolkata. A new store is slated to open in January in Pune. But this time around, Geiger is not leaving everything to their partner. L’Occitane India appointed Guillaume Geslin, who worked in Shanghai and was part of making the brand a great success in China, managing director for the Indian market in August 2009. It has also given the master franchise for L’Occitane spas to Sanghvi Holdings in India. “I could not watch the business going downhill from the sidelines. Yes, I did not have any experience in the beauty business, but I was willing to take the risk," says Geiger, who had studied mechanical engineering in Switzerland before doing his master’s in business administration. The company started its expansion plan in the US, Brazil and Asia in the late 1990s. Asia was always high on Geiger’s list of potential markets. Having set up and run a packaging company in China in the early 1990s, Geiger says he was impressed with the work ethic of Asians and believed that these would be the markets of the future. “When we decided to expand in Asia, an important associate from our auditors PricewaterhouseCoopers came to visit me and said: ‘I must suggest you stop your activities in Asia. This will kill your company.’ It is not very comfortable hearing your auditor tell you this, but after the 10-second shock at his words, I remember telling him, ‘You take care of our accounts and leave it to me to decide what I want to do with my company.’"
Asian tiger: Geiger says he is a risk taker. He believes India is the next big market for L’Occitane products and says the skincare company has plans in place for both men and women. 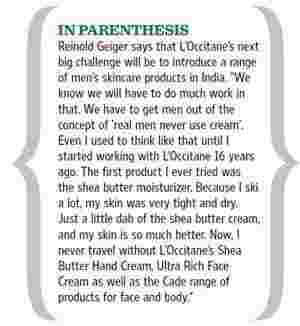 Ask if L’Occitane did some research before venturing into India for the second time, and Geiger just shrugs. “No, but that is the characteristic of a small entrepreneurial company. We don’t drown in research. We live in the skincare industry, we breathe it. We operate our own stores and are in touch with our customers directly. So we learn on the ground," he says. Besides, he believes, it’s still early days here. “The country where we faced most competition was Japan and we are doing well there. We even had to introduce a new line of skin-whitening products, language was a problem, retail space was very expensive. By comparison, in India we can still afford to hire retail space, everyone here speaks English, which is a huge advantage. In India, we do not see strong local companies to give us the kind of competition we had in Japan. Special skincare products of these small companies in India are not much developed." Doing business in China for over a decade has taught Geiger to take Asian idiosyncrasies in his stride. Yes, there are bureaucratic delays here; yes, there are not enough retail spaces with great infrastructure; yes, the retail staff has to be trained extensively because most of them have never sold skincare products before and sometimes it is just too tough to sell the ideology of the company to them. But Geiger still believes that India will be an adventure and not a roller-coaster ride. “At least here everyone understands you. You can get your point across to the authorities because everyone is conversant with English. It is much tougher in China and even in Brazil. I have travelled to many countries, but this visit by far has been among my easiest trips." As far as experimentation and introducing products suitable for the Indian consumer go, Geiger says that as a company they have always been open-minded. “We have never said that our products can be used by all as they are. We see what works in which market, what the demands are, and accordingly make adjustments." For example, L’Occitane has found that strong scents do not work with Asians. Geiger says its flowery, light scents are best-sellers here and hence they concentrate more on rose and verbena scents. Selling haircare products is also tough in India. “And elsewhere too actually because, unlike a decade ago, suddenly which shampoo you use has become important to customers all over. This is a bit strange." In India, Geiger finds that the L’Occitane’s range of moisturizers are popular. “We thought people would be attracted to toiletries (soaps, gels) to start with, but the moisturizers are in demand, especially the Immortelle skincare range." Meanwhile, right after breakfast, Geiger had plans to head out to see how the three L’Occitane stores in the Capital are doing. “Merchandising is important and we have a book for getting it right, but the staff still needs to work on their instinct. I want to see what their instinct says about the products."